ABOUT: Jane is a wedding, lifestyle and portrait photographer who approached Paperknots to create branding that would reflect her natural, fun and relaxed style of photography. The outcome saw a logo created from hand-written style typography which added a personal, friendly touch, combined with a delicate calligraphy style monogram to add style and sophistication. The monogram then has the ability to become a logo in itself – allowing Jane to use this as her watermark. 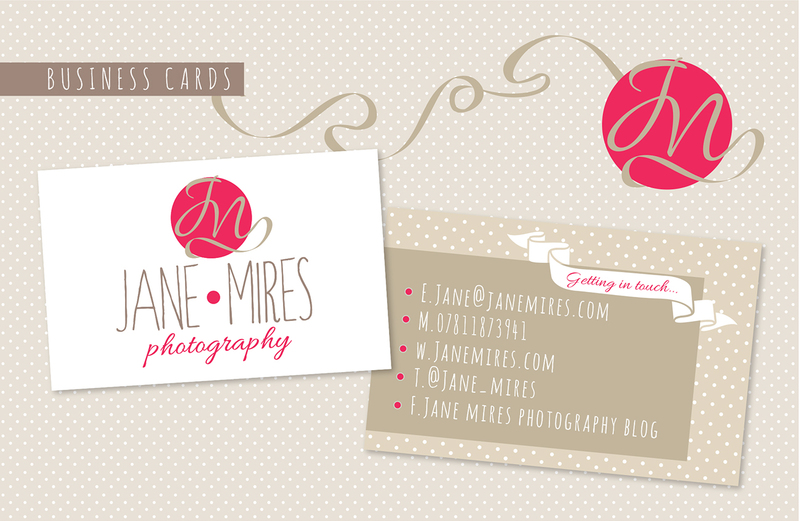 Taking the brand further, Jane asked Paperknots to look at business card and social media branding. Fun polka dots were introduced to inject personality and the ribbon from the monogram was extended to create a free flowing ribbon which helped to link items together. Playing with the idea of ribbon, a ribbon banner was added to create space for highlighted key features or messages. Scattered polaroids not only emphasise the photography element but also help to keep the relaxed look and feel to all the design.